May 2012 – He Said What?! So often Aaron’s honesty in his comments can nearly take our breath away…………sometimes because we’re fighting the desire to speak as honestly with him as he does with us……….or because we’re laughing so hard. He just doesn’t seem to “get it.” Or just doesn’t care. It’s hard to tell with Aaron. Aaron likes to read at night before he goes to bed. It’s actually the only time during the day that he will sit down and read a book. We’ve tried and tried to get him to read at other times during the day, but in Aaron’s rigid world the time for reading is only at night. He has his bed just right, with pillows here and pillows there……….and always his back scratcher by his side……….don’t ask my why. He will read one of his Handy Answer Books until he gets sleepy. The other night I walked in to tell him good night and there he was, with his opened Handy Answer Book on his lap…………and leaning over with his eyes closed. Good grief! He looked like a dead body, honestly, which can be a little shocking to this tired mom at the end of the day. At any time of day, actually……..but I certainly react differently when I’m tired. I touched him and he stirred, so I said, “Aaron, you need to close your book and go to bed. You’re falling asleep while you’re sitting up.” And of course, he had one more small section to read because he just HAD to finish that certain part. He read it quickly and then packed it up and went to bed. Yes, Aaron. I remember telling you that. That was it. He just had to tell me that I was either right or wrong about that subject. The jury was still out on this matter, according to Aaron, and he wasn’t sure if my advice was working for him or not. Gary, Andrea, and I had to laugh at how matter-of-fact he was. Right or wrong. The end. Hmmmmm………….now wouldn’t that just cut out a lot of MY words and leave more time for Aaron to talk?! That seems right or wrong to me. As I’ve written before, Aaron has an interest in where people are from based on their skin color or their accents or some other feature that peaks his interest. For instance, I blogged in the past about the time that he kept telling me about his new driver in his day group – (Where is He From? Dec 30, 2011). He was sure that she was African…………and then I met her and was sure that she was NOT African. Turns out she is from Vietnam. His attempt to identify people or languages or looks can be quite funny at times. Personally, I don’t really care much about Unicron in any way but I know that off and on for the next 14 months we will be having these conversations………….so I may as well ask and get it over with. How does Unicron look different, Aaron? I was trying to remember exactly what I observed when Aaron was gleefully sharing that Transformers 4 movie trailer with me, and all I could remember was looking at the little numbers that showed how long I was going to have to stand there and endure watching this yet-another movie trailer. What kind of beard? You know, Aaron, I just really don’t remember much about that beard. I am certain that there are many Mexican men whom Aaron has seen that have some sort of unique chin beard that Aaron identifies as being uniquely Mexican. I am fairly clueless, but Aaron is sure of this fact and so I don’t disagree. I just shake my head in some sort of understanding way that satisfies Aaron and allows us to end this conversation. Aaron is also fascinated by a Mexican radio station that he has heard. Every now and then he will walk up to my radio in the kitchen, and without permission he will begin to push the button in order to change the station. I know exactly where he is going with this. Soon I hear the unmistakable sound of Mexican music, and Aaron laughs and rubs his hands together in excitement. This occurred the other night………….again……….and Aaron happily asked me if I liked this music and did I understand what they were saying…….or singing. “Mom, is this a Mexican station? Or is that a Spanish station?” This brought on a long discussion about the country of Mexico, but the language they speak is called Spanish. No, Aaron, the language is not called Mexican…………it is Spanish…………and we had a little brief history lesson in the midst of the loud Mexican/Spanish music…………..with me knowing full well that Aaron wasn’t totally listening to me as he stood there rubbing his hands together amidst the sounds of trumpets and maracas. He loves to identify flags from around the world on our large world map still hanging downstairs in our old schoolroom. Which reminds me of the time years ago in the day school when Aaron said they were told to draw a flag……………and I looked down in horror to see the flag that Aaron had drawn………….the Nazi flag. We had seen a special on television and had studied this in history in home school and through normal exposures……………Aaron had decided that this flag was very interesting. Oh my. Well, it was simple to draw and it was at one time a flag………….but why is Aaron always drawn to the forbidden? To the unacceptable? Thus ensued another lesson and afterwards Aaron was more sure than ever that this was indeed a very interesting flag. Sigh. Did you say country or continent, Aaron? Stifling laughter as I tried to answer this question was indeed difficult. And slightly confusing, even to me. Aaron is so global! I just have a hard time following him! Aaron has always had the sharpest eye of anyone I’ve ever known. He’s also very curious. I can’t begin to count the number of times we’ve heard him say, “I was just curious……..” and then proceed to tell us or show us what he was just curious about. His other favorite comment is, “I was just looking.” And my repeated response to that statement is, “Aaron, you never just look. You touch, and pick up, and open, and taste……….” My statement has never, ever made a difference in Aaron’s touching, and picking up, and opening, and tasting. Sometimes it’s a good thing that he has an eagle eye. He has found money in parking lots, or even found wallets, and is very proud to turn these items in to the store where he found them. We’ve let him keep small amounts of money, and of course that makes him very happy. Even a penny, to Aaron, is a worthy find that pleases him greatly. Other finds are not so good. He’s often come home with someone’s hair band or hair clip that he’s found laying somewhere and stuffed in his pocket. Yuck! I never know what he’ll pull out of his pocket on any given day after he comes home from his group. When he was younger, and attended school in Germany on our military post, he came home with quite an assortment of treasures. He had a box that held the treasures that I let him keep, so nearly every day after he showed me what he had found and if I let him keep it, off he would trot to his room to deposit his new item in the box. One day he came home with something that wouldn’t fit into his pocket. He was pushing a bike! And I made him push it right back to the dumpster where he found it! Then there was the day in second grade that I’ll never forget. As Aaron walked the short distance to his school, he passed by a set of military quarters that were being repaired and painted. On this particular day, Aaron was sitting in his reading group and the volunteer mom on that day was reading to this sweet little group…………when out of his pocket Aaron pulled a box cutter. Yes, a box cutter! He found it on the ground near the building that was being remodeled. I don’t know the exact sequence of events after that point, but I do know that the mom was calm and the teacher was summoned and the box cutter was taken away and then I received a nice little call from the school principal. I remember saying, “Aaron did WHAT? !” and then walking to the school towing little Andrew with me as I wondered how long Aaron would be suspended. However, the staff was very kind and understanding. Aaron was given a good talking to and had some fear put in his heart – but over time he continued to stuff his pockets full of whatever caught his eye – just never another box cutter. Golf balls have always been a favorite of his. Don’t ask me where he’s found all the golf balls over the years, but his nightstand drawer is still totally full of his golf ball acquisitions gathered over the years. He refuses to part with them so there they stay, safe and useless but of great meaning to Aaron. Another great favorite of his is ball point pens. He has dozens of pens from businesses that I know he’s never been to………at least that I know of………..but somehow he finds these pens and into his pocket they go. Or we’ve come home from stores or from doctor’s offices, and the next thing I know, I find a pen from that place laying on his desk. He is very quick and very sly about slipping pens into his pocket when we’re standing at a doctor’s office and signing in, or at Great Clips for a hair cut, or at the grocery store…………he’s not choosy about where his pens come from. I’ve learned to tell him right away to stay away from the pens, no matter where we are………..but sometimes he still slips by my not-so-sharp eyes and comes home with a new pen. Oh well! When Aaron eats, he somehow and for some reason must have multiple pieces of silverware. I always give him a spoon, even if we’re having pizza, but no matter what we eat and no matter what silverware I set out, he will quietly……..as quietly as Aaron can be…………edge over to the silverware drawer and pick out several more pieces. The other night I had given him a fork, a spoon, and a knife……….and as we were getting ready to sit down, I saw Aaron ease open the silverware drawer and quietly slide one more fork, one more knife, and one more spoon into his pocket. The problem was that he was wearing soft nylon sport shorts with an elastic waste. He looked hilarious as he tried to walk slowly and quietly across the kitchen floor with his pocket bulging and the silverware softly clanging against his leg………..and his pants starting to slide down from the weight of the hidden silverware. I hid my face and chuckled, and didn’t let on that I saw him as he sat very gingerly on the chair…………clang, clang…………and attempted to not get pierced by the fork and to remove them without Mom and Dad catching on. There is no reason to correct him. I turned around to see him pulling out of his bottomless pocket a HUGE wad of napkins. 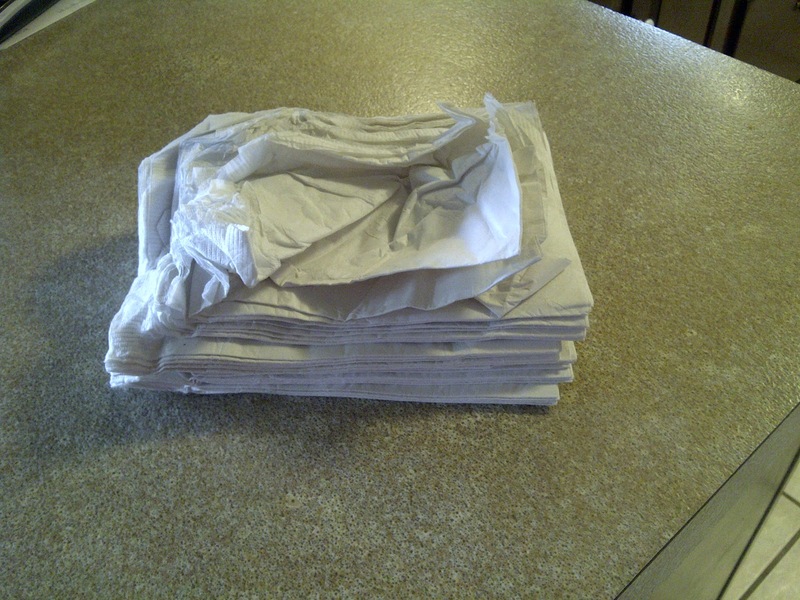 Oh yes, I forgot to mention that Aaron seems to have a need for multiple napkins at every meal……….but this stack of napkins was really overkill! Good grief, Aaron! He had enough napkins for several rows of theater patrons! Aaron, nothing is wrong with getting a few napkins. Getting this massive amount is ridiculous! Aaron, I get one or two. Because my pockets are not as deep as yours, Aaron! That seems to be all he understands anyway! I was driving home after running some errands on a warm morning a few days ago. 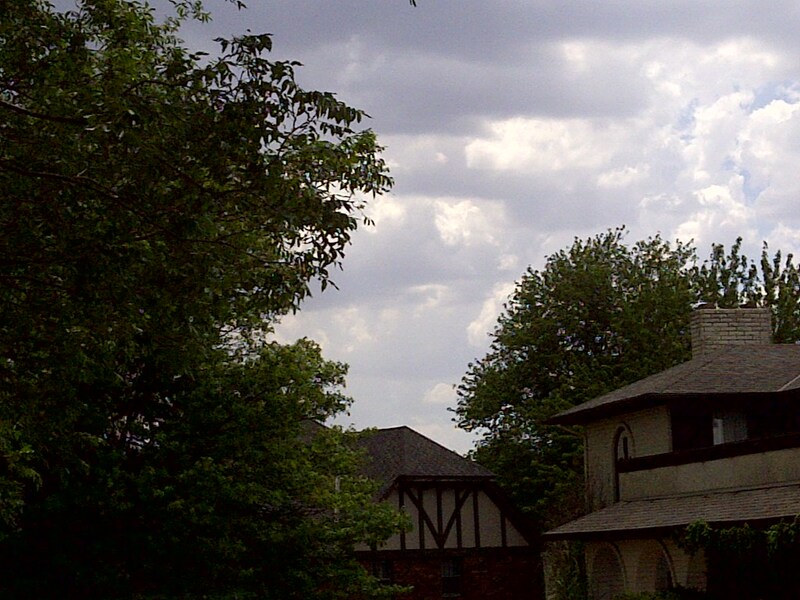 It was another windy day, not at all unusual on a spring day – or on any day – in Kansas. I was driving down a fairly busy two lane road, though at this time of day there was not a huge amount of traffic. My thoughts were on what I needed to accomplish on this Monday after a very busy weekend. I had piles of laundry waiting for me at home, as well as cleaning and cooking to do. I was sorting out the priorities on my to-do list, lost in thought as I drove toward home. Up ahead, on the side of the road, I noticed some geese walking along. Their long necks and turning heads were obvious even from a distance away. Geese are very common here as they enjoy the many neighborhood lakes in the area, or gather in the farmer’s fields and eat whatever it is that geese like to eat out among the growing crops. I hardly gave these geese a second thought as I drove toward them, although it did register that it was a little odd for them to be walking beside a road such as this. 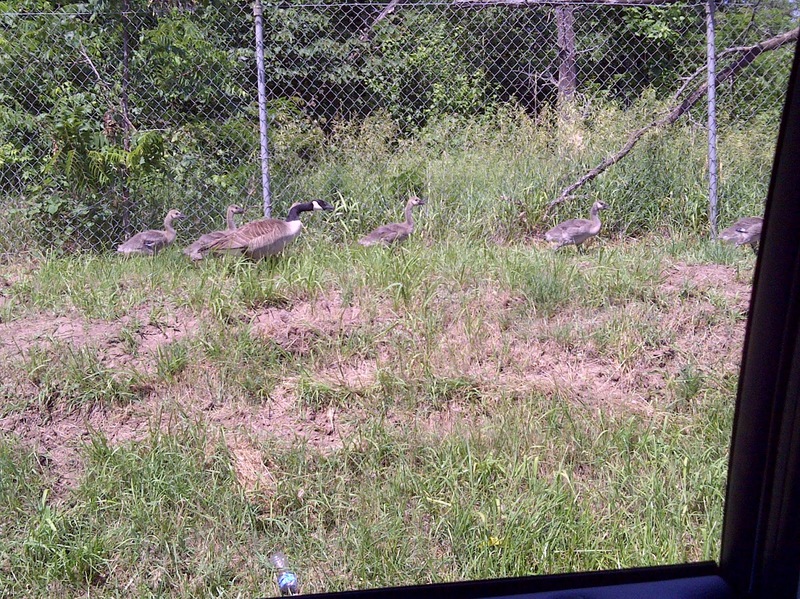 As I neared them, I saw why this group of geese was walking where they were without flying away to a safer location. There were several adult geese and between the two groups of adults there toddled several little goslings. These young geese were not tiny babies, but were still fluffy with soft down and very much in need of the guidance and protection of their parents. The adult geese were working to guide their young charges away from the road, for they sensed the danger that lay there. 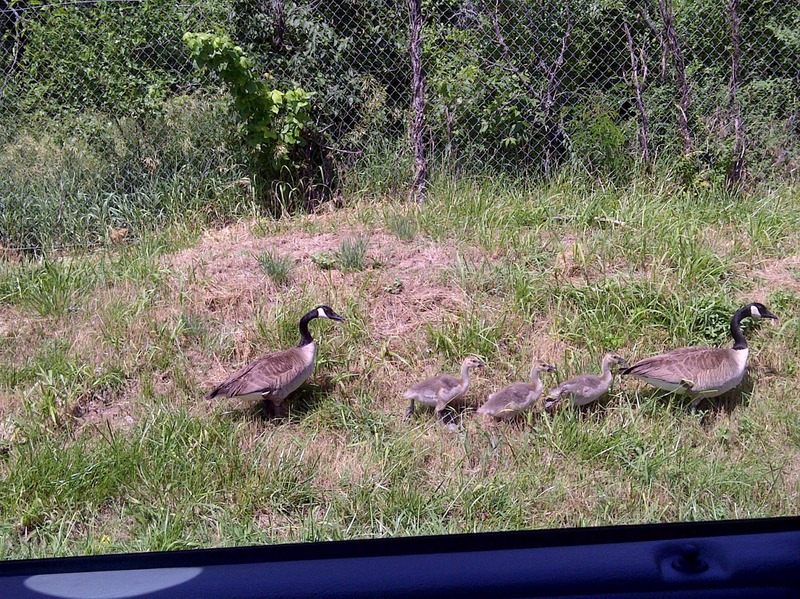 The baby geese were chirping and looking all around as they followed the direction of the lead adult goose. The parent goose in the rear was making sure that the babies stayed in line and didn’t wander off into danger. Since no traffic was behind me, I was able to observe the geese for a minute. The parents surely weren’t very comfortable with this precarious situation, but they must have had a good reason for leading their precious babies beside this hazardous road. The baby geese totally trusted their wise parents, even though I imagine they must have wondered where they were headed and why this route was chosen. Or maybe the babies had strayed into this bad situation and the parents had no choice but to safely lead them out. The adult geese were diligent in their leading and in their protection of their babies. They could easily have flown away to their own place of protection, but the love of their babies held them there. The babies followed their parents, trusting them despite the noise all around them and the threat that was only steps away. I had to drive away before I knew if this family of geese made it their destination. 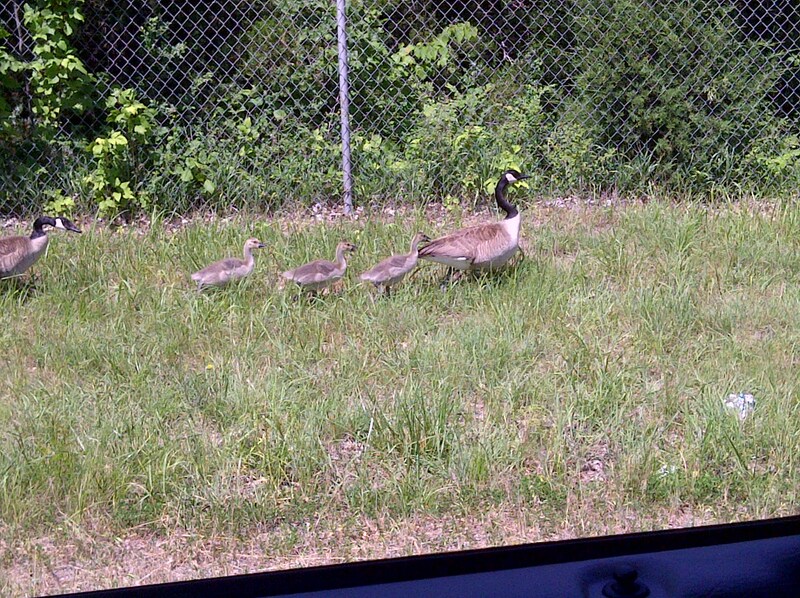 As I drove home, I thought of how similar our lives as believers are to those of the baby geese. We are in need of guidance as we walk the dangerous path of this world. It’s so tempting to run off in this direction or toward that temptation, even toward things that seem outwardly pleasing and innocent. Only God knows the right path that we should take. The only safe route for us is to follow Him, and we do that by reading our Bibles and spending time talking to Him. The road beside us may look appealing and desirable, easier to walk on than this bumpy path that God has us upon. But what does God have to say about that desire that we have? Is it safe? Is it one that will bring Him glory? Or is it full of hidden dangers that will leave me injured or even dead? Our responsibility is to follow God, even when we don’t understand the course that He has chosen for us. The way may be full of loud danger that is close at hand, threatening to destroy us. We may fear that the trail is too rough and that we can’t handle what may come our way. Just as the baby geese trusted their parents in the midst of traffic and the uneven ground, we need to trust our Heavenly Father in the midst of the turmoil all around us and the fear within us. The baby geese had to walk through some scary and rough turf before they could make it to their destination, but they knew they could count on their parents to guide them safely there. We may have to walk through some tough times, too, but we have a Father Whom we can fully trust. He has a plan and a reason for the way in which He leads us. David knew this concept very well as He ran from Saul and from danger, and had to trust God even when he didn’t understand the way or the reasoning. I imagine there were times that David felt he had a better plan than God, but he learned to let God be the One in charge. David learned the hard way that giving in to temptation only brought the danger home and the consequences were costly. In Psalm 5:8, David said: “O Lord, lead me in Your righteousness because of my foes; make Your way straight before me.” Our goal should be to let God do the leading and make our ways straight as we do the following and the trusting. So let’s follow our Father and fully trust His wise care. Gary and I had a little get-away this past weekend. We took a quick overnight trip up to Topeka to see our son, Andrew, at the NHRA Summer Nationals at Heartland Park. He works on the pit crew for Scott Palmer whenever he has the opportunity between college and other responsibilities. 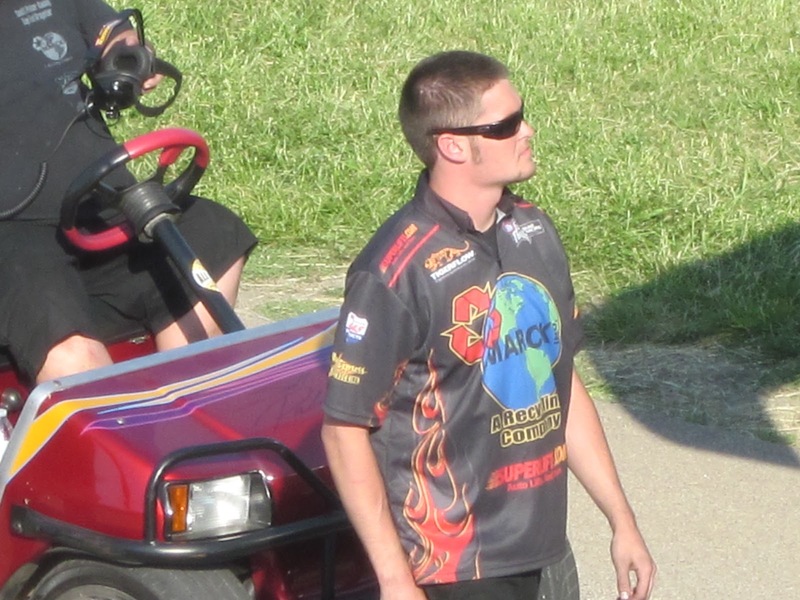 It was fun and interesting to go and watch him work on the top fuel dragster. Andrea came home for the night on Friday to stay with Aaron. Aaron was very excited about this. He loves it when Gary and I are gone for awhile, and someone else is there with him. I think he sees it as a new opportunity for the things he loves……….which would be food and talking. Surely this new person will have new food ideas. And surely this new person will LOVE hearing about all the things that Aaron LOVES talking about. Of course, Andrea isn’t a new person. She knows Aaron every bit as well as we do…………and she came anyway. Way to go, Andrea! She and I were texting while I was in Topeka, and we talked once. Aaron kept trying to call me or Gary, but it’s very hard to hear anything at the race track. Plus I knew what he wanted to talk about and I knew that it could wait. Our catching up time would come soon enough………..and it did! Andrea told me to be ready. You see, Aaron went to the movies Friday with his group and saw the new movie, Battleship. It doesn’t matter that the review I read was dismal and that the movie had a rating of only 1 1/2 stars. To Aaron, Battleship is an epic movie…………and when Aaron watches an epic movie, we are all treated to a seemingly endless rerun of all its epicness…………over and over and over again. Gary and I pulled into the driveway on Saturday evening and before I was out of the van, Aaron came through the garage door. Of course, as always, there was no “Hi, Mom!”………or “Did you have a good trip?”………….or any other personal comments such as you would expect. Of course, we don’t expect that from Aaron so it’s no shock or disappointment to us. We would actually be shocked if he DID say one of those personal things to us! So Aaron walked to the van and said, “Mom! I went to see Battleship!” Well, let’s not waste any time. We may as well get to the point at hand right away. After all, Aaron had been saving up his words and I had been saving up my ears. There was no running away from it now. As we unloaded the van, greeted big old Great Dane Jackson, and tried to put things away………Aaron was right there, and the commentary was in full swing. “Mom, Battleship was a good movie!” And I asked, “So you liked it, Aaron?” Of course he answered…….”Yeah! It was a big navy ship! There were lots of weapons!” On and on and on Aaron talked, following me as I put things away in the kitchen. We hadn’t been home more than 15 minutes before I was upstairs staring at his computer screen as he showed me two clips from the Battleship movie on YouTube. He loved the scene where they took the helmet off the alien and shined a light in his eye, only to find that he wasn’t really dead, and he raised up off the table, and he grabbed the man by the throat, and everyone was yelling…………..including Aaron…………..and leaning over rubbing his hands together………….Aaron was, not the alien. Oh my. How soon would Monday come and Aaron would be going to his group? We have talked………….actually, Aaron has talked and we have mostly listened…………to all sorts of rehashing of the Battleship movie. Are the creatures aliens? Or are the creatures Martians? What is an alien? What is a Martian? Does an alien look like a bear? Are those soldier guys in the Army or in the Navy or in the Marines? Why would an alien want sharp teeth? Would I want to watch Battleship? When will Battleship be out on DVD? Last night at supper, as Aaron chowed down on his second helping of Potato Salad and a chicken thigh……….boneless, the way he likes them………….he lowered his voice and in an almost hushed tone, he said, “Do you know what Andrea said?” He paused and waited for an answer, so I told him no, that I didn’t know what Andrea had said………..and he continued, “Before she left, Andrea told me that it was nice to spend time with me.” He is so touched by these words…………and so are we. Aaron does know when he is loved and these words touch a chord in his heart. How precious that Andrea said those words to him……..and how profound that his heart was touched. We just never know all that goes on inside our Aaron. But he does love to talk, and I think Aaron has caught us up on all the news there is to know………and most of it we really didn’t want to know, but I didn’t tell Aaron that. Last night he and I played two games of Skip-Bo and he talked some more about Battleship…………..and the genetically altered Rats movie that he’s watching now and that I had to go watch a clip of (another story)…………….and many, many other issues that are of interest to Aaron. Believe me, only to Aaron. As I finished cleaning up the table and getting ready to fix the coffee pot for the next morning, Aaron sat on the ottoman in the family room……………talking………..even after I had told him to go on up and get ready for bed. He asked, “Do you want me to just sit here and talk?” I had to laugh. He was so serious and so oblivious to my NOT wanting him to just sit there and talk. It was after 10:00 and I was all talked out, believe me! So I told him that even though that would be nice, it really was time to go to bed, for all of us………….and so finally he made his way upstairs to his toothbrush and minty mouthwash and his bed with the covers just the way he likes them in the proper order and his Handy Answer Book that he’ll read before he turns his lamp off and writes his going-to-sleep time in his notebook just right and then turns his monitor on for me to hear all night and settles down under his mound of covers with his head on his pillow that he makes sure has the zipper on the correct side……………yes, it’s nice to spend time with Aaron. A little quiet time is nice, too. Good night, Aaron. Morning and more talking will come soon enough. Good, Aaron. I’m glad you went and glad you got pizza. Was it good? He then told me that he got a Root Beer and that it said it did not have caffeine, so we had a long discussion about caffeine. But what he was most excited about was this: “Mom, the lady at the pizza place told me that I could have a free refill!” And of course, Aaron got the free refill………..do cats have a climbing gear, as Gary’s sister, Sandra, would say? “And Mom, I got a knife and fork to eat the bread sticks with.” I asked him why he needed a knife and fork for bread sticks, since we always pick those up with our hands………….and in talking to Aaron I realized the reason. His fingers had pizza on them, and he will not mix up his foods, if at all possible. I know he really doesn’t like his foods touching on his plate, and today he didn’t want his pizza fingers to touch his clean, garlic bread sticks. Oh, Aaron, you are so interesting sometimes. Many times! The insecticides did come, Aaron…………except we call them exterminators. Clean bread sticks because of his knife and fork………….clean bug-free house because of those insecticides that came today. Life is good! A little weird, but good! My morning was full of errands that I had run in our summer heat. 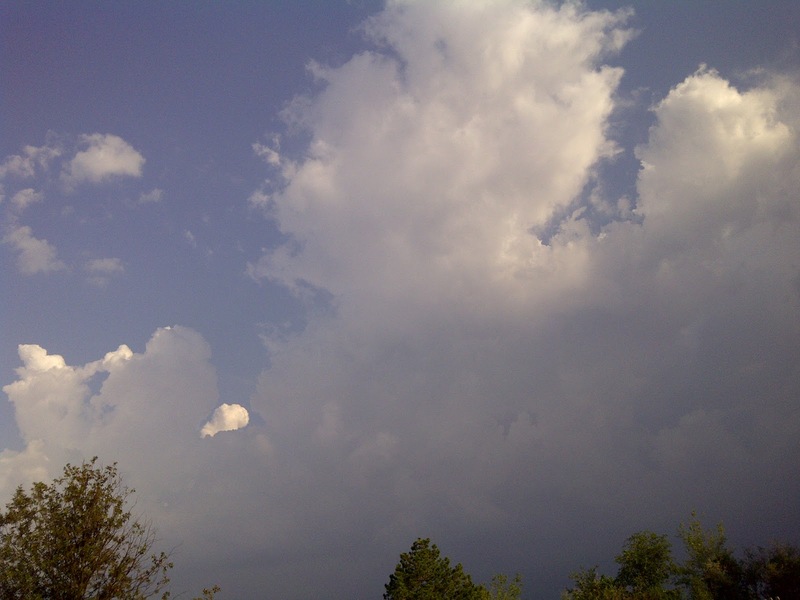 As I drove home I was noticing some hopeful signs of rain as I glanced up at the sky. There on the horizon was the tell-tale sign that rain was around us, off in the distance. Perhaps. When you’ve lived in a location long enough you can just tell what the weather may be at times without any definite word from the weather guys. But this summer has been unusual and disappointing as we’ve had extreme heat and a severe lack of rain. Was I being too hopeful? After I had been home for a couple hours, though, the skies were definitely darkening and then I heard the unmistakable sound of thunder. What a relief! And even though it was still very hot, I decided to sit out on the front porch and revel in the awesome sounds and smells of a good thunderstorm. It reminded me of sitting on our front porch on Third Street when I was a girl and how I loved feeling close to a summer storm. Today the lightning flashed a few times and the thunder rumbled. The wind blew faster and faster, whipping up the dry dust and dirt. Finally I went inside and smiled as I turned on the radio. Sure enough, the announcers were in full storm mode as they announced the severe thunderstorm warning, and the mobile units began reporting. These guys had been quiet for so many weeks and they sounded positively gleeful to be reporting on a good old Kansas storm again. I went about my cleaning, all the while looking out the windows and waiting for the much needed rain to begin. I moved some plants off of their plant stands so they wouldn’t blow over but left them where they would get the moisture that was surely coming. I kept looking to the skies and seeing the dark clouds, but I also noticed how the skies to our west were turning light. Soon I knew what was happening. This storm was going to miss us. All the rain was to the east of us and we wouldn’t get a drop. How disappointing to be so close and yet so far! I knew that many people were receiving the wanted rain, but we were not to be one of those. It was tempting to complain, to sulk, to feel envious of those “lucky” people who got the wonderful rain while we remained barren. This incident brought to mind some attitudes that I have fought over the years. How many times has something good happened to someone else and instead of feeling joyful I find myself battling jealousy? It’s not something that any of us want to admit. I find it easy to compare myself to others and find myself coming up short. Why do others seem to be the recipients of so many blessings while in those same areas I feel dry and barren? This kind of thinking will lead to a shriveled heart instead of a healthy heart that is genuinely able to share in the happiness of others. Paul reminded us in Romans 12:15 to “Rejoice with those that rejoice and weep with those that weep.” Unfortunately, sometimes it’s easier to weep with someone during the sad times than it is to rejoice with them over their good times. A rejoicing attitude requires an unselfish way of thinking, and this just doesn’t come naturally. It requires a work of the Spirit in our hearts. Our yearning for the refreshing rain of blessing mustn’t become a source of jealousy towards those whose lives seem blessed over and over again. Gary, unaware of my thoughts, said it very well when he prayed before supper tonight and said, “And Lord, thank you for all the people who got some rain today. We ask for rain, too, but thank you for sending it to some today.” May I learn to rejoice with others even as the dreary dust may blow around in my life, trusting God to send me some rain when He wills to do so.